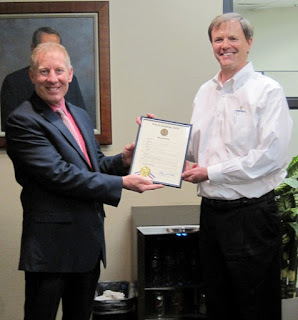 Americhem owner and CEO Rick Juve and the company’s executive committee accepted the proclamation on behalf of over 800 Americhem employees around the world. The company was also recognized with a full page article in Plastics News covering the anniversary. The Summit County (Ohio) Council will soon recognize Americhem with a special commendation on their 75th anniversary. Photo: Americhem board chairman and owner Rick Juve (right) accepts a special Americhem anniversary proclamation from Cuyahoga Falls Mayor Don Walters.